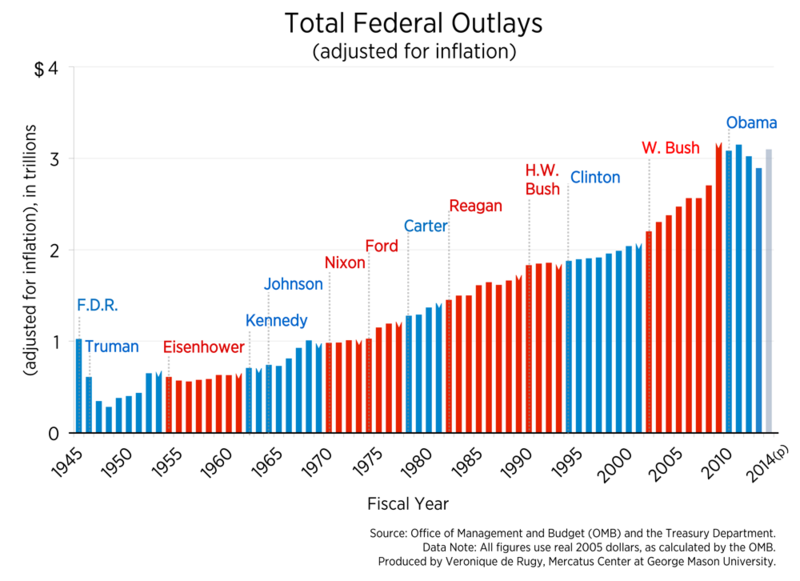 Federal budget deficits recently declined from historic highs, but this represents only a temporary respite from the government’s growing fiscal imbalances. Deficits will begin growing again in the next few years, causing publicly held debt—already at historically high levels—to exceed the size of the entire economy in the next 25 years, according to the most recent long-term estimates by the nonpartisan Congressional Budget Office (CBO). The longer policymakers delay the needed course correction, the more economic growth and prosperity will be undermined, and the more likely it will be that ill-conceived policies will be rushed through in the face of a crisis. The Mercatus Center’s Spending and Budget Initiative provides policymakers with reliable, high-quality information about budgets, spending, deficits, and debt and how these issues relate to economic growth and progress. The principal cause of the unsustainable projected fiscal path is overspending, which drives all other fiscal consequences. Federal spending growth, propelled by the largest entitlements, will outpace economic and revenue growth. This results in mounting debt and interest payments that will increasingly suffocate economic growth and reduce future generations’ standard of living. The debt will siphon resources from priorities such as transportation, education, and national defense while jeopardizing the entitlement programs themselves. Achieving long-term fiscal control requires fundamental, structural reform of the entire federal budget—spending, taxes, and the budget process—and reform must reduce spending to sustainable levels. 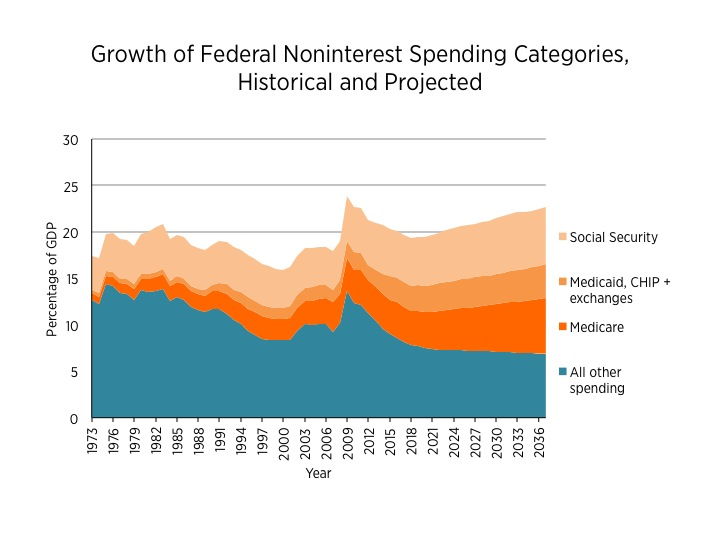 More than three-fourths of the currently projected long-term fiscal imbalance derives from a set of decisions made between 1965 and 1972: specifically, the creation and subsequent expansion of Medicare and Medicaid and the automatic indexation of Social Security benefits. Growth in these three programs, along with the health insurance exchanges established as part of the 2010 Affordable Care Act (ACA), drive the government’s unsustainable fiscal condition. Any strategy that fails to reform these key contributors to long-term deficits will inevitably fail to correct the federal government’s untenable fiscal outlook. Social Security. 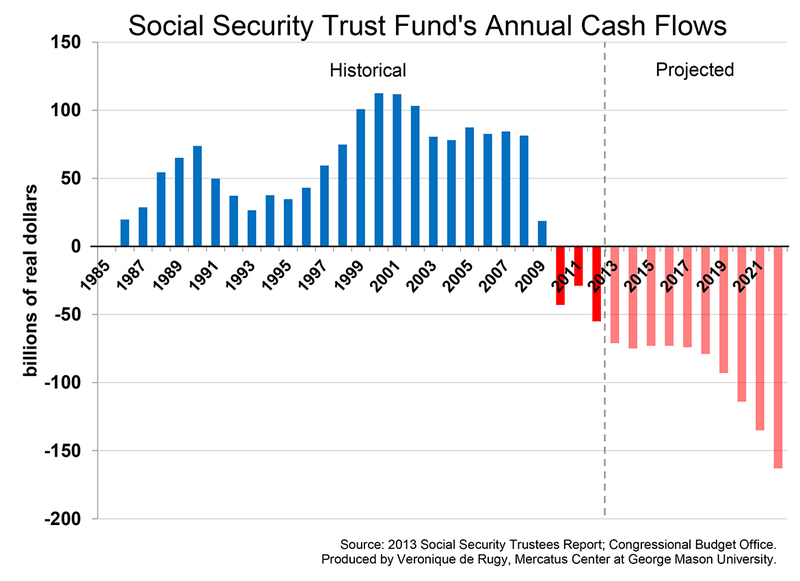 The long-warned-about Social Security financing crunch is now arriving. Its root cause is costs rising faster than its tax base can sustain, driven by population aging—due to the retirement of the huge baby-boom generation—pay-as-you-go financing, and rising per capita benefits. Rearranging the deck chairs, rather than slowing cost growth, would be an inadequate response with potentially ruinous implications for the program. Social Security has two trust funds: (1) the Old-Age and Survivors Insurance (OASI) Trust Fund, which furnishes support for retired workers, their spouses, their children, and survivors of deceased, insured workers; and (2) the Disability Insurance (DI) Trust Fund, which provides payments for disabled workers and their dependents. The DI Trust Fund is the more immediate problem, with projected depletion in 2016. At that point, unless the law is changed, disability payments will drop by 19 percent. Some advocates suggest that the problem can be resolved simply by reallocating payroll taxes between Social Security’s trust funds. But this approach would not only fail to fix the DI fund’s underlying problems, it would also further deplete the OASI Trust Fund, whose long-term finances are already weaker than those of DI. It is critical that policymakers understand that there is much less time to fix Social Security’s finances than the insolvency dates might suggest. The program faces a larger shortfall than at any time since the last major financial rescue in 1983 and the longer policymakers delay acting, the more impracticable their policy choices become. For example, one longstanding proposal has been to slow future benefit growth for high earners to the rate of price inflation, while allowing low-income earners the higher growth rate of wage inflation and leaving previous beneficiaries unaffected. Yet because of delay in action to date, if every participant’s benefit growth were now slowed to the rate of price inflation, the program could not maintain benefits for those over age 55 and remain solvent. Social Security also faces a growing threat to its unique financing arrangement, in which workers’ contributions, not general tax revenues, finance benefits. This earned-benefit structure was intended, in part, to distinguish Social Security from welfare programs and to protect its benefits from competition for funding by other government programs. Social Security’s contribution-benefit link was formally broken with the 2010 payroll tax holiday, which reduced the payroll tax and subsidized the program from the general fund. Although the payroll tax cut expired after 2012, the long-term implications of severing the program’s contribution-benefit link are not yet clear. To the extent that it either sets a precedent or permanently undermines previous public perceptions of Social Security as an earned benefit, the change could have substantial ramifications for future Social Security policy. These include rendering Social Security benefits as unpredictably changeable as those of general revenue-financed programs. Finally, several design features of Social Security undercut the nation’s economic growth. These include disincentives for work, savings, investment, and caring for dependent children. Various reforms to encourage work—such as fairly compensating those in early and middle age who extend their working years—would benefit both Social Security’s specific financing and general economic growth. Medicare. As with Social Security’s retirement program, the greatest challenge facing Medicare is demographics. 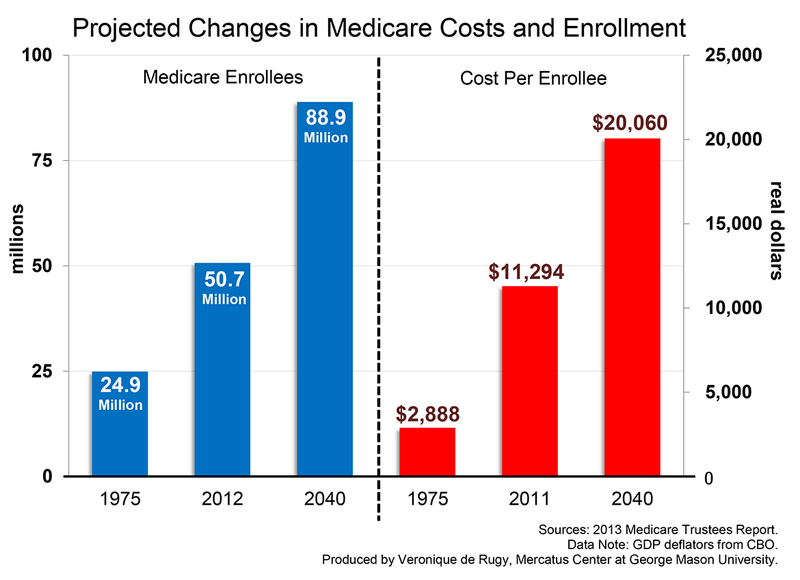 The Medicare trustee’s 2014 report shows that the program’s costs will rise rapidly through the mid-2030s as baby boomers swell the beneficiary rolls, and the number of workers financing each Medicare beneficiary will decline from about 3.2 in 2013 to 2.3 by 2030. Even after the baby-boom surge is finished, the effects of this demographic shift will persist: costs will continue growing faster than GDP because of rising benefit costs per person. Medicare costs are 3.4 percent of GDP today but are projected to reach 5.4 percent of GDP by 2035, and 6.9 percent by 2088. These facts are too easily lost in the excessive attention given to the projected date of depletion of Medicare’s Hospital Insurance (HI) trust fund, now projected for 2030. This fund represents only one part of Medicare, and less than half of program spending ($266 billion in 2013). Payments for physician services (Part B) as well as prescription drugs (Part D) are made from Medicare’s Supplementary Medical Insurance (SMI) trust fund ($317 billion spent in 2013). SMI is kept solvent by statutory design; only about one-quarter of its revenues are provided by beneficiary premiums, while the other three-quarters are provided from the government's general fund in whatever amounts are necessary to finance benefits. Thus for the majority of Medicare, solvency is not a meaningful concept. Medicare's financial strains are not principally manifested in the threat of trust fund depletion but in rising pressure on the federal budget and on premium-paying beneficiaries. Moreover, at the beginning of this year the HI fund’s assets were less (76 percent) than one year’s costs. This percentage is down from 83 percent at the start of 2013. With such an insignificant trust fund balance it does not take much of a nudge in either direction to move the depletion date by several years. For example, if temporary sequestration under the Budget Control Act were overridden, the date would move closer again from 2030 to 2028. 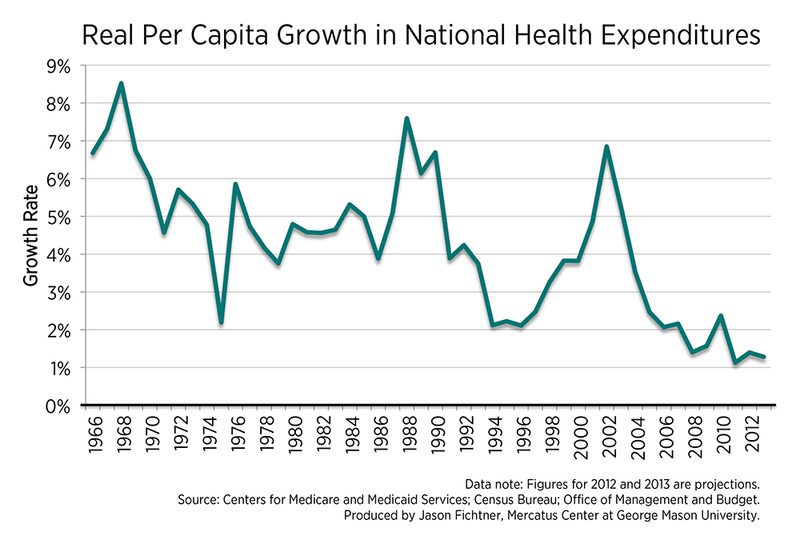 It is also highly unlikely that the deceleration of medical care cost growth reflects sustainable changes in the health system that may ease the pressure on Medicare finances. Indeed, increases in Medicare costs per beneficiary are currently projected over the long term at much slower than historical rates, which some analysts regard as unrealistic. Those projections assume full implementation of provider payment reductions imposed by the Affordable Care Act (ACA), even though some experts have questioned the long-term viability of those reductions. It is far more likely, as the Medicare trustees emphasize, that actual Medicare costs will be higher, not lower, than currently estimated. Even in the most optimistic of the trustees’ scenarios, prompt and substantial additional financing corrections are necessary to sustain Medicare finances. Such reforms will be less disruptive to beneficiaries, health care providers, and taxpayers if they are enacted soon rather than after a period watching hopefully to see whether the problems will simply go away, rendering these difficult decisions unnecessary. Medicaid. Medicaid is now the largest health insurance provider in the United States. Unlike Medicare, which was created to provide health coverage to those age 65 and older, Medicaid’s intent was to cover care for financially limited individuals of any age. Medicaid is on a trajectory to require increasing resources from state and federal governments, creating difficult budgetary tradeoffs for both unless major reforms to Medicaid are implemented. Based on preliminary estimates from CMS, Medicaid expenditures per year are expected to increase by approximately $500 billion between 2012 and 2021—roughly a 108 percent increase. It is important to note that CMS assumes universal expansion of the Medicaid program to include the ACA-intended beneficiary group. Even if one argues that it is incorrect to assume universal participation, the issue of increasing Medicaid expenditures has plagued the health insurance program since its inception. But the economics of Medicaid are only part of the problem. Growing evidence shows that Medicaid also badly fails the very enrollees it is designed to help. The ACA’s Medicaid expansion further complicates the mounting burden of Medicaid costs on states’ budgets. Although the Supreme Court struck down the law’s attempt to make the expansions mandatory, it left intact the generous financial incentive for states to expand their Medicaid programs. As a result, states now must weigh the burden of higher state Medicaid expenditures under expansion against the benefit of maximizing externally financed health benefits for their citizens. Both considerations are powerful, and responsible elected officials can be expected to weigh them differently according to their state’s unique circumstances. The 1996 welfare reform law’s success demonstrates that block grants offer a viable means of tailoring programs for state conditions and creating better incentives for spending tax dollars efficiently. It also offers several contributions to the debate over extending block grants to Medicaid and other joint federal-state programs. By incorporating Medicaid reform lessons from the states, policymakers should be able to save time, build greater consensus, and deliver more effective Medicaid services to participants at a lower cost to taxpayers. The Affordable Care Act. Contrary to its supporters’ claims, the ACA will exacerbate projected federal deficits and increase an already unsustainable federal commitment to health care spending. As an extensive 2012 fiscal analysis of the ACA explains, there are several reasons for this unfolding fiscal disaster. The ACA relies on substantial savings already required under previous law to maintain the Medicare HI Trust Fund’s solvency. These do not represent new net savings, available to be spent without widening the deficit, as the health care law assumes. They are merely substitutes for spending reductions that would have occurred by law without the ACA. Under the federal government’s trust-fund accounting methods, these same cost-saving provisions are also counted as extending and expanding Medicare’s future spending authority. Thus, the ACA’s total new spending well exceeds its cost-saving provisions. The 2012 study indicated that the legislation would increase net federal spending by $1.15 trillion from 2012 through 2021 and would add $340 billion to $530 billion to federal deficits in the same period. Subsequent analysis of the ACA’s deficit impact, even using a different methodology, confirms this finding. Adding to the law’s financial problems, many of its cost-saving provisions are not being enforced. Examples include the ACA’s individual and employer mandate penalties, scheduled Medicare Advantage cuts that have been rolled back, and several other tax provisions. In addition, many doubt that backup savings from the Independent Payment Advisory Board—a separate panel charged with identifying further restraints if necessary—will ever materialize. Another significant problem with the ACA is that it will reduce employment, and this impact will arguably exceed that of any law enacted since World War II. The very benefits the ACA provides create three major employment disincentives: (1) an explicit tax on full-time work, (2) an implicit tax on full-time work for those who are ineligible for the ACA’s health insurance subsidies, and (3) an implicit tax that links the available subsidies to workers’ incomes. An updated analysis of the ACA’s disincentives to work estimates that they will reduce weekly employment by about 3 percent, or roughly 4 million full-time equivalent workers. This impact is nearly double that of CBO’s most recent estimate. For decades, America’s health care debate has pitted Left against Right, federal against state, public against private. All sides, however, have shared a similar, inhibiting mindset—an excessive aversion to risk and deference to medical insiders—instead of stressing the ideal goal: better health for more people at lower cost year after year. From fortress to frontier. This “fortress”-like mentality has limited innovation in health care, constraining medical advances and raising costs. Shifting to a “frontier” approach—one that tolerates risk and opens the field to other participants and disciplines—would bring to health care the creativity seen in fields such as information technology. Address supply as well as demand. America’s health care debate has focused almost exclusively on demand: how many people have health coverage and how providers are paid for services. Successful reforms must ease limitations on both demand and supply, promoting innovations that can alter the nature of health care delivery and lower costs. Reform step by step. Health care reform does not require wholesale, politically unrealistic attempts at change. Reformers should identify and eliminate piecemeal the legions of obstructions to supply and innovation, thus gaining incremental and possibly rapid victories. Break down barriers. This approach will avoid the same centralized overreach that characterizes both the ACA and “repeal and replace” proposals. It would also eliminate the need for one grand bargain—or for total control of Washington, DC, by one party. 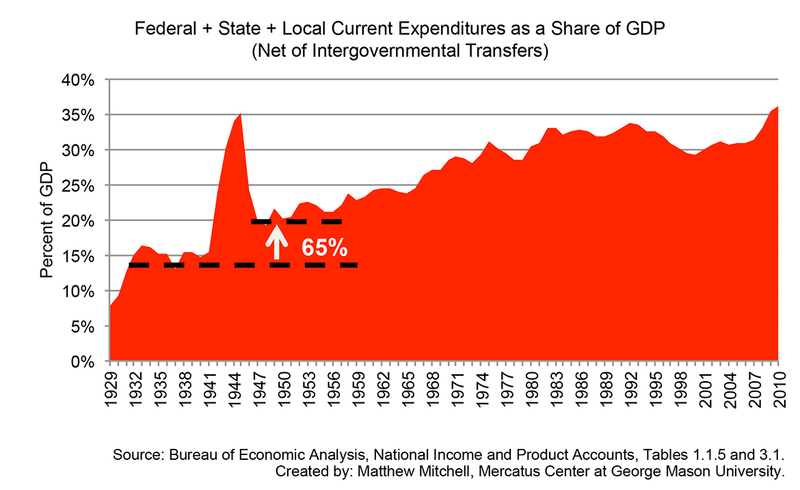 While discretionary spending consumes only about one-third of the budget and is not the principal cause of the federal government’s budgetary problems, it still contains significant amounts of excessive and wasteful spending. This funding—in amounts that Congress appropriates each year—should not be immune from spending restraint. In the Budget Control Act of 2011, Congress adopted spending limits enforced by automatic reductions called “sequestration.” The sequester has not reduced overall federal spending levels; it has merely slowed total projected spending growth slightly from 2013 through 2023. Nonetheless, both sides have exaggerated the impact of sequestration and have sought to roll back even this modest spending restraint. Policymakers have claimed they need to undo part or all of the sequester to boost economic growth, but this is a fallacy. As one key study showed, for example, a dollar increase in federal defense spending results in less than a dollar increase in GDP if that spending is deficit financed. In contrast, analysts have found that over five years, for each $1.00 reduction in defense spending, private spending increases by $1.30. While one can reasonably debate the effect of across-the-board spending cuts on national security, dire predictions of their impact on the economy and jobs are significantly overstated. Moreover, the federal government undertook several massive spending measures ostensibly aimed at “stimulating” the economy. Among them are the Economic Stimulus Act of 2008 ($152 billion), the 2009 American Recovery and Reinvestment Act (ARRA) ($862 billion), and the Hiring Incentives to Restore Employment Act of 2010 ($20 billion). These, too, have proven ineffective. The ARRA, for instance, was supposed to create jobs, but instead it largely moved workers from private-sector to public-sector employment or to government contracting positions. In addition, evidence shows that such spending is less effective the more it is used. Even if one argues that more government spending can jumpstart the economy, the stimulus spending typically proposed—particularly infrastructure spending—cannot be implemented in the “timely, targeted and temporary” way proponents say it should be. In addition, while no one disputes the value of good infrastructure, this type of spending frequently suffers from massive cost overruns, waste, fraud, and abuse. The basic goal of tax policy is to raise sufficient revenue to meet the government’s spending requirements, preferably with minimal impact on market behavior. US tax policy has long failed to achieve this goal. By distorting market decisions and the efficient allocation of resources, the tax code impedes economic growth and, thus, potential tax revenue. The nation’s persistently sluggish economy and troubling long-term fiscal outlook have increased the urgency to reform the federal revenue system. Adding to the problem, the tax code itself is expensive: Americans face nearly $1 trillion annually in hidden tax-compliance costs, while the Treasury forgoes approximately $450 billion per year in unreported taxes. An ideal tax code would be simple, efficient, equitable, and predictable. The policies most likely to accomplish these aims, and to promote solid, sustainable economic growth and revenues, are as follows: (1) Lower current individual and corporate tax rates, because the more capital and labor are taxed, the less they are produced; (2) broaden the tax base so more citizens pay something—even if it is very little—to help ensure people feel both the benefits and the costs of government spending; and (3) eliminate tax loopholes, which distort market behavior based on tax preferences and discourage the best and most productive economic decisions. 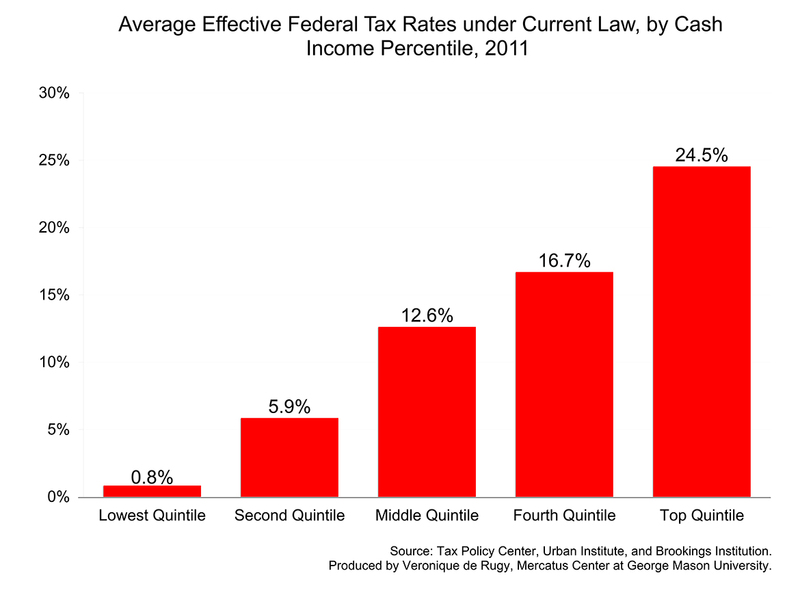 Lower the corporate income tax rate. The US corporate income tax rate should be reduced to at-or-below the statutory average of 23.4 percent assessed by Organisation for Economic Co-operation and Development (OECD) countries and ensure that the statutory combined (federal, state, and local) rate also falls below the OECD average of 25.1 percent. Move toward a territorial tax system. Moving toward a territorial system would significantly reduce the inefficiencies, inequities, and complexities of the current US corporate tax system; help level the playing field for domestic firms; and remove a major incentive for US multinational corporations to move their headquarters overseas. Potential reforms include exempting all foreign-source income, exempting only active foreign-source income, or exempting only certain kinds of foreign-source income. Policymakers also agree on the need to address the tax code’s loopholes. Many loopholes are known as “tax expenditures” because, although they are applied through the tax code, their effect is similar to that of spending provisions: They encourage certain behaviors by subsidizing them. 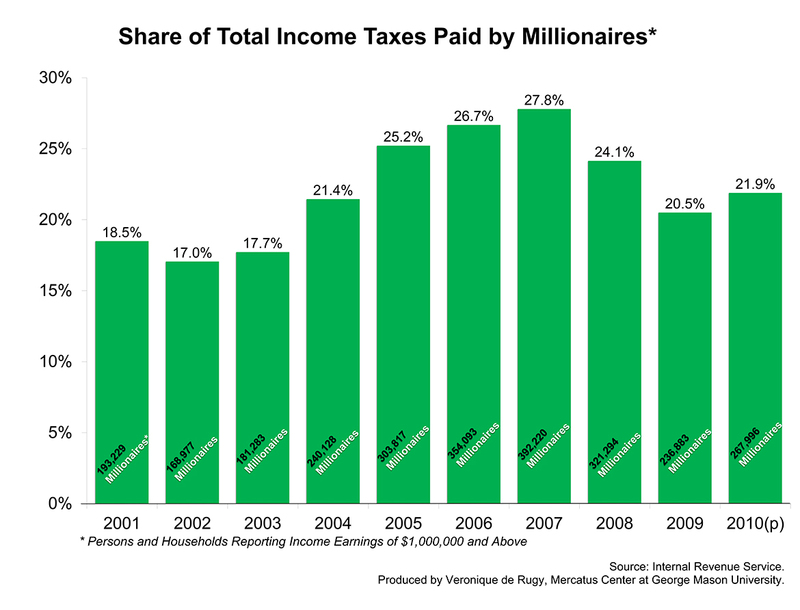 These provisions apply to both individuals and corporations, and while not all tax loopholes are tax expenditures, and not all tax expenditures are bad tax policy, they total more than $1 trillion per year and have distortionary effects on the economy. Among the largest tax expenditures are the home mortgage interest deduction and the exclusions for employer-provided health insurance and pension benefits. One fundamental problem with these provisions is that because they are part of the tax code—reducing revenue from what it otherwise would be, rather than overtly increasing spending—they mask the true size and scope of government. Roughly 20 percent of tax expenditures goes to corporations, distorting their economic decisions in favor of qualifying for these tax breaks rather than directing resources to the most productive uses. Corporations divert significant resources away from pro-growth activities and toward the unproductive—but critical to competing with other US corporations—activity of fighting for more and bigger tax breaks. Economically optimal tax reform will eliminate tax expenditures while simultaneously lowering marginal tax rates across the board. Otherwise, removing tax expenditures would amount to a tax increase on the economy as a whole, resulting in slower economic growth and lower future tax collections. Many complain that the congressional budget process is complex, outdated, and must be reformed to be useful. But Congress cannot escape its own accountability for the breakdown in the process; lawmakers have largely abandoned the regular practice of budgeting for the past several years, compounding the problem of uncontrolled federal spending. The House and Senate have not agreed to a congressional budget resolution—the key instrument for setting fiscal policy—since April 2009. 1. It lacks the enforcement mechanisms necessary to compel Congress to follow it, and it is riddled with loopholes that allow Congress to evade whatever limits it sets. Congress must choose to voluntarily follow and enforce the law—which it seldom does. 2. It fails to require Congress’s annual review of entitlements, with the results that the government spends nearly two-thirds of the federal budget (including interest payments) on autopilot. While attempts at budget-process reform that do not address entitlements will have minimal impact, simply weaving entitlements into the current system, which is largely ignored, is not the answer, either. The best approach to improve the federal budget process is the creation of a new budget act with real, strong, and enforceable budget rules that apply to all spending and that require Congress to meet spending or deficit targets. A constitutional amendment would be the ideal reform, as it holds the best hope for making budget rules stick. Recent research demonstrates that successful fiscal adjustment works when it employs a strategy of spending reductions and policy reforms to increase competitiveness. These structural policy changes include the liberalization of markets for labor, goods, and services; readjustments of public-sector size and pay; and public pension reform. Out of more than 100 countries studied over the past 30 years, roughly 20 percent reduced their debt-to-GDP ratios using this approach. The other 80 percent used a “balanced approach,” which meant some spending cuts coupled with large tax increases. The latter approach has proven disastrous: it fails to stabilize the debt and is more likely to cause economic contractions. Two good examples of success are Sweden and Canada. Sweden’s experience indicates that significantly cutting government spending without an equivalent increase in taxes can provide a path to fiscal sustainability. Sweden successfully reduced welfare spending and pursued economic stimulus through a permanent tax reduction, including a 20-point reduction, to 57 percent, in the top marginal income tax rate. The country’s commitment to reform has paid off in economic expansion: Sweden’s recent economic growth has trumped that of every other European country, including a 6.1 percent growth rate in 2010 following the 2009 recession. Canada reduced its federal deficit by cutting spending and eliminating tax exemptions—not by raising individual income tax rates or by pursuing more progressive taxation. The bottom line is this: with most countries focused on short-term goals, those that pursue spending cuts along with measures to increase competitiveness will achieve better results over the long term. The US Export-Import Bank (Ex-Im Bank) is a Depression-era relic. This federal export-credit corporation subsidizes the exports of a handful of US firms while exposing taxpayers, borrowers, and consumers to risk. Proponents claim that the Ex-Im Bank supports small businesses and jobs by leveling the playing field. The data, however, do not support this claim. Ten large corporations are the primary beneficiaries of the Ex-Im Bank’s financing. The Ex-Im Bank privileges subsidized firms over their unsubsidized competitors, draws capital away from other unsubsidized borrowers, and puts taxpayer money at risk, all while making US firms less dynamic and less efficient. The Ex-Im Bank doesn’t account for the jobs it destroys. The Ex-Im Bank claims that its subsidies supported approximately 164,000 jobs in 2014. But this figure does not account for the unseen costs of the bank, which include displaced employment among unsubsidized firms that compete with Ex-Im-subsidized firms and firms that purchase products that are made more expensive by those subsidies. Each year, Ex-Im subsidies impose net costs of about $3 billion on 189 US industries. This means slimmer profit margins, lower growth, and dampened employment across firms that have to compete against those firms receiving Ex-Im Bank subsidies. The true cost of the Ex-Im Bank on the economy is understated in the cost data for the agency because: (a) they do not include costs imposed on domestic manufacturers who compete with Ex-Im Bank subsidized exporters; (b) the estimates of job creation do not take into account the value of forgone investments that might otherwise have been viable if Ex-Im Bank subsidies did not draw capital away from other, non-subsidized projects; (c) they do not include “rent seeking” costs associated with seeking and maintaining Ex-Im Bank subsidies; and (d) they do not include other costs that typically occur when particular firms are privileged, such as loss of productive efficiency, misallocation of talent, and excessive risk taking. The Ex-Im Bank subsidies do not increase net exports. Veronique de Rugy found that less than 2 percent of total exports are assisted by the Ex-Im Bank. In 2014, only 1.2 percent of US exports received assistance. The vast majority of benefits conferred by the Ex-Im Bank are concentrated on a handful of states, like Washington State, Texas, and California. Washington received 43.6 percent of total disbursements from 2007 to 2014, primarily because Boeing—the single largest beneficiary of Ex-Im Bank financing—builds its airplanes in Washington State. De Rugy also found that 42 states received less than 2 percent of disbursements and 35 states received less than 1 percent. Should the Ex-Im Bank portfolio fall into insolvency again, as it did in 1987, taxpayers in all of these states will be responsible for bailing out the bank. The Ex-Im Bank is projected to cost taxpayers $2 billion. The Ex-Im Bank’s accounting and risk assessment practices, which it uses to calculate the cost projections, have been consistently criticized by the US Government Accountability Office and its own inspector general for methodological weaknesses. The CBO published a study showing that under proper accounting, the Ex-Im Bank is estimated to cost taxpayers at least $2 billion over the next decade rather than to save taxpayers $14 billion, as proponents have claimed. The Ex-Im Bank has a history of poor financial management and, in 1987, requested a $3 billion federal bailout, following seven years of losses ranging between $250 and $300 million.